When to use RxBlocking vs. RxTest? Previously, I wrote about the basics of testing with RxBlocking in Testing with RxBlocking, part1. Since then, I presented 2 times at meetups about MVVM and RxBlocking and I thought I’d post few more examples in a broader context. But first a question I got several times already when discussing RxBlocking. 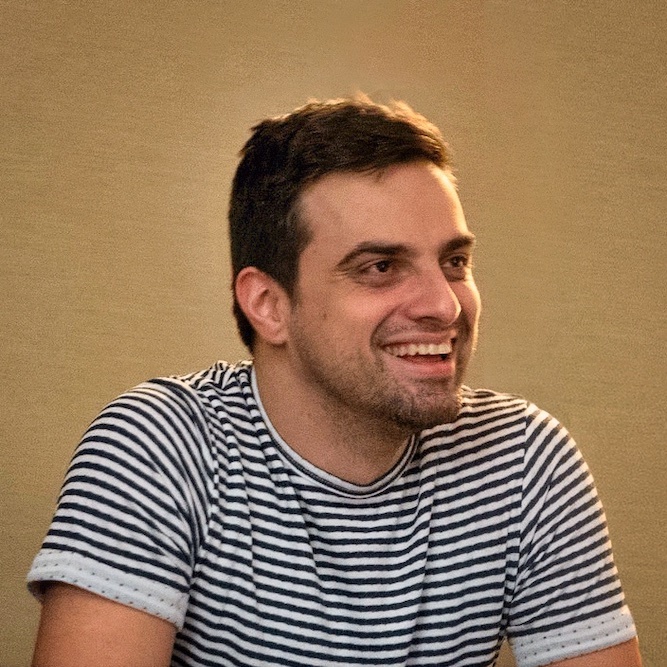 RxTest is a great library for testing RxSwift code. 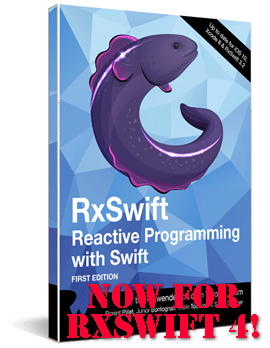 It offers everything you need to test your Rx code and in most cases it’ll be everything you need. In edge cases in which you cannot control the source of asynchronisity for example you need to have a different approach. RxBlocking is great when you need to wait until one element is emitted, record it, and then consume another one, etc. A good example is code that uses RxRealm - RxRealm relies on Realm’s own notification system to produce change notifications and wraps those as observables. In this case you don’t know exactly when the notification will be emitted since that’s up to Realm. Furhter, changes to the database that are committed soone after each other might (or might not) be bundled together as a single notification by Realm depending on the available resources. Therefore to test correctly RxRealm observables you need to wait for an element before triggering the next one to guarantee the change notifications won’t be bundled together. In this post I’ll look at the RxRealm test budle which I created some time ago with RxTest (not realizing there was the RxBlocking library to test async code). Disclaimer: Provided the code depends entirely on the Realm dependency the tests in the suite are more of integration tests than unit tests. That’s also one of the reasons why the suite requires RxBlocking. let result = try! items.skip(1).toBlocking(timeout: 1).first()! The .toBlocking() API as explained in the previous part about testing with RxBlocking allows me to simply “wait” for an element to be emitted by the observable and then grab it and compare it to the value I expect. Bam! Right tool for the job, eh? 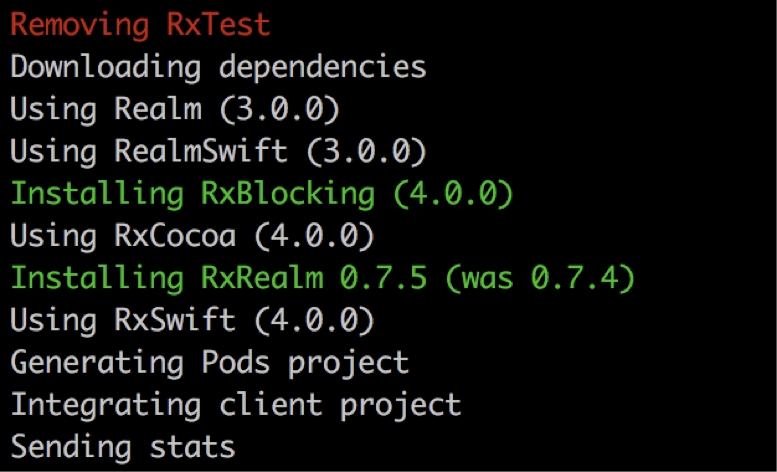 I could realatively quickly churn through RxRealm’s test suite and migrate to RxBlocking. In fact, after the migration I didn’t need RxTest at all. And the current version of the test suite is: 921 lines of code. I did also some general refactoring of the test code but using the right tool really helped save a lot of code in there. In this test, I needed to simulate an error while writing objects to the Realm.rx.add() sink. setup: The setup includes creating a realm configuration pointing to non-existing file and a recordedError variable to log the error. trigger: I schedule an async task that will write a single object to rx.add() and in the error handler I simply store the error in recordedError. let error = try! recordedError.asObservable().skip(1).toBlocking(timeout: 1).first()! In this test I want to delete objects from a Realm via the Realm.rx.delete() sink. There are two separate delete() sinks - one as a static property and one as instance property. I’d like to test both from a single test case. setup: The setup includes observing all persisted objects in the realm in order to record the emitted states. trigger: I first write 4 objects to the database, then delete 2 via the instance sink, then the other 2 via the static sink property. Finally, let’s look into this one weird test case that needed a bit of a deviation from the pattern. RxRealm allows you (to a degree) to easily subscribe or observe on different schedulers. For example you can create a bunch of Realm objects on the main thread, but write them to Realm on a background thread. Or create the objects in the background but decide to write them on the main thread to the database. In this test I wanted to cover a number of different setups and run them all at once and test that all commits are written to the database and the final state of the database is what I expect it to be. The pain point here is that some of the Realm notifications will be bundled and/or delivered in unpredictable order, depending on GCD’s queue that will write the changes. So, the only thing I can and want to test is the final state after all changes have been written to the database. setup: The setup includes an observable that emits the list of ids of all objects in the database. This is what I’m gonna use at the end of check if all my objects were successfully written. trigger: The test code includes 6 different async tasks - each creating or writing objects on different queues. All the tasks are scheduled to run immediately. test: The test code is where it gets interesting. I create an observable called until which will emit once after it detects 6 objects being stored in the database. Now, items will stop emitting whenever until detects there have been 6 objects stored and I can grab the last value and compare it to the list I expect to have in the Realm.